They are not a perfect team. They are still learning the offense, still learning the defense and still learning how to win. Still, for the Florida Gators, this will do. 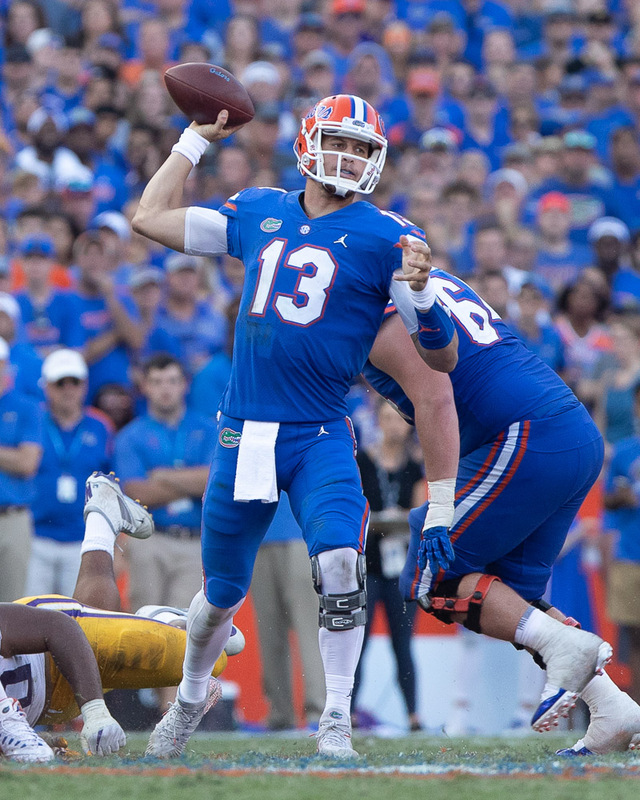 The Gators overcame it all Saturday in a 37-27 win over Vanderbilt. It was Florida's fourth straight win. "This team's learning a lot of different ways to win games," Florida coach Dan Mullen said. "We've won some games following the plan to win. We've won games making the big, explosive play. We've won that drag-out, back-and-forth brawl. We come in today, and we don't follow that plan to win. "But we kind of find a way not to let go of the rope. You find a way. If you're getting dragged across the field, and it's burning your hands, you don't let go of the rope. You just grasp and you hold on until you get your feet on the ground and you start tugging and pulling back. And we did that." Lemical Perine ran for 129 yards and Jordan Scarlett for 113 in Florida's comeback. Quarterback Feleipe Franks threw for 284 yards and two scores. Perine also caught four passes for 93 yards. The Gators fell behind early, 21-3. The moment that most people will talk about, however, was a yelling exchange between Mullen and Vandy coach Derek Mason. Florida has an open date next weekend. UCF 31, Memphis 30: For a change, the Knights found themselves in a ballgame Saturday. They won that one, too. UCF trailed Memphis 30-14 with two minutes to go in the first half, yet rallied for the one-point victory. Still, it wasn't over until UCF made a tackle at their own 31 that allowed the clock to expire. Had Memphis been able to get out of bounds, a last-second field goal would have been possible. McKenzie Milton threw for 296 yards to lead USF, 148 of them going to receiver Greg Davis. Perhaps the biggest play of the game for UCF came when coach Josh Heupel went for a fourth-and-one at his own 29, and Taj McGowan broke a 71-yard touchdown run. Heupel said his message to his team once Memphis had their lead was simple. UCF plays at East Carolina on Saturday. Virginia 16, Maimi 13: The Hurricanes suffered the worst kind of loss Saturday night, one that left them unsure of just how good they were and unsure of who their quarterback was. Miami coach Mark Richt, who had earlier turned to freshman N'Kosi Perry, turned back to former starter Malik Rosier after Perry had a dreadful start to his game. He hit only three of six passes for 20 yards and had two passes intercepted before giving way to Rosier. Rosier had an 11-yard touchdown run with 3:04 to plaly, but he wasn't great, either. He hit 12 of 23 for 170 yards and an interception. The Hurricanes had entered the game 5-1 and ranked No. 16 in the nation. The Hurricanes were averaging 41.5 points per game. Miami has an open date next weekend. FIU 24, MTSU 21: The Panthers were another team that came from behind to win, scoring 11 points in the final period to edge Middle Tennessee State. Quarterback James Morgan threw for 311 yards and two scores in the FIU win. FIU is now 4-2 on the season. Morgan hit receiver C.J. Worton for a 23-yard touchdown with 3:55 left for the winning points. The Panthers tacked on a two-point conversion. For the night, Worton caught five passes for 113 yards. FIU plays host to Rice next Saturday.